Patrick Murphy Plan to destroy Medicare, raise taxes on the middle class and enact crippling new taxes and regulations on small business. Murphy’s plan includes the largest tax increase in history for the Middle Class, $716 billion in cuts to Medicare, and job-crushing regulations and taxes on small business. Defeat Patrick Murphy! Vote for Allen West for Congress.. George Soros Pledges $5M to defeat Allen West. Liberals socialists want West's voice silenced. Keep an outspoken conservative warrior in the U.S House of Representatives. Tags: Allen West, Patrick Murphy, Florida, District 18, U.S. Congress, election 2012 To share or post to your site, click on "Post Link". Please mention / link to America's Best Choice. Thanks! Posted by Bill Smith : Post Link --> 8:16 PM 0 Comments - Share Yours! Election Day is Tuesday November 6, 2012 and polling places will be open from 7:00 a.m. until 7:00 p.m. . . . In Hillsborough County, an additional referendum is on the ballot: Amends Charter To Require Financial Impact Statement For All County Charter Amendments And Countywide Referenda . . . In addition, there are three Florida Supreme Court judges who are up for merit retention, and four judges in the District Courts of Appeal. For a record of their rulings, Restore Justice has prepared a guide, which you may download by visiting their site here. Please read their analysis and then make your own decision as to whether we should retain these judges. In a Press Release: The Republican Party of Florida board voted to oppose the retention of these Florida Supreme Court Justices. 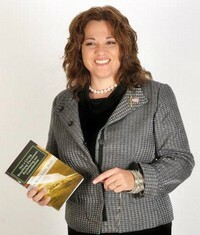 Laura Rambeau Lee is an active member in the conservative movement in the Tampa Bay area. She writes on political issues locally, nationally and globally, with particular concentration on energy, education, housing and mortgage, Shari’ah in the United States, transportation, and the U. N. Agenda 21 move to implement its programs in local governments across the nation. Tags: Tampa Bay Area, voting locations, Hillsborough County, Pinellas County, Hernando County, Pasco County, Polk County, Sarasota County, Manatee County, Florida Supreme Court judges, Amendments, Florida Constitution, Laura Rambeau Lee, Right Reason To share or post to your site, click on "Post Link". Please mention / link to America's Best Choice. Thanks! WOW - 11 Proposed Amendments To the Florida Constitution! There were 12 proposed but Amendment 7 didn't pass the requirements to be on the ballot. The following excerpt shares the introduction to the 2012 Florida Amendment Voter Guide by KrisAnne Hall. Visit the online guide to the Amendments and the authors insights on the Constitutional way to vote. Don't change OR give up your future rights and those of your children without first Reviewing the Amendments and reading this guide! By KrisAnne Hall: The Introduction To The Guide: This guide is designed to inform the voter on certain aspects that I do not see being presented in other voter guides. The voter is always ultimately responsible for their vote. I do not take responsibility for anyone’s vote; we will all answer individually one day for our choices. With that in mind, be sure that you VOTE YOUR CONSCIENCE! I had hoped we had learned about cluttering up our Constitution when we passed the “pregnant pig” and the “super train” amendments. For the rest of the country, yes, Florida did establish constitutionally protected rights for pigs, yet somehow we have a problem establishing constitutionally protected rights for unborn children. The Constitutional Amendment we passed for a High Speed Rail nearly bankrupted the state. We established that the people had a constitutional right to a form of transportation that we had no means to fund. Consequently, we had to pass another Constitutional Amendment to withdraw the previous one, uselessly expending an enormous amount of tax payer dollars on both ends. The amendment process represents a great expense to the tax payers. Laws should be passed by LEGISLATORS and put into statutes. That is how Republican Governments work. Repealing or amending statutory laws are part of the everyday legislative process. So if legislators forget to put something in a law or the law turns out to be a bad idea, the legislators simply amend or repeal the law through proper legislative measures. The Constitution provides the basis for the Legislature to create these laws consistent with the Constitution with language such as “The Legislature may, by general law, enact…” NEARLY EVERY ONE OF THE AMENDMENTS ON THIS BALLOT SHOULD HAVE BEEN RESERVED TO STATUTORY LAW AND NOT CONSTITUTIONAL LAW. Why would our legislators want to use the amendment process rather than the proper legislative process? In some of these instances, they tried, but the legislation failed. They are cluttering up our Constitution to compensate for failed legislation. Perhaps in other instances, by enacting a law through the constitutional amendment process, they can mitigate their responsibility for the law; after all, it was the “will of the people.” We are a representative government, not a democracy. Our constituency is not adequately informed to make the necessary decisions on these amendments (e.g. pregnant pigs and bankrupting super trains). If the Legislators insist on using the amendment process instead of the proper legislative process, I frankly see very little need to continue having legislators. We could simply move to a pure democracy, fire all those who feel too burdened to do their job and save some money. Read the 2012 Florida Amendment Voter Guide. KrisAnne Hall is an attorney and former prosecutor. But more important, she knows and travels the country and teaches the Constitution and the history that gave us our founding documents. She is a US ARMY disabled veteran, a Russian linguist, a mother, a pastor's wife and a patriot. Awarded the Freedom Fighter award by Americans for Prosperity, the Certificate of Achievement from the Sons of the Revolution for her defense of Liberty, and Congressman James Blair Award for Defending the Constitution. Tags: 2012 Election, Florida, Voter Guide, Constitutional Amendments, Florida Constitution, Krisanne Hall, vote To share or post to your site, click on "Post Link". Please mention / link to America's Best Choice. Thanks! Posted by Bill Smith : Post Link --> 11:50 AM 0 Comments - Share Yours! 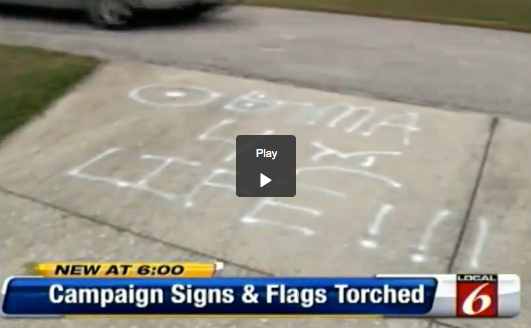 Florida: Romney Signs, American Flags Torched In Veteran’s Yard, “Obama 4 Life” Spray Painted . . .
Weasel Zippers: Thug tactics for a thug candidate. LAKE COUNTY, Fla. — Police are searching for the vandals who apparently torched more than a dozen campaign signs and American flags in a Howey-in-the-Hills veteran’s yard. This is the first thing I saw was this sign painted on my driveway,” Overbay said. Howey-in-the-Hills police say no one left any clues behind to identify themselves. Overbay said as a Vietnam-era veteran, the hard feelings caused by the vandalism run deep. Tags: Florida, Lake County, vandalism, vets home, burned campaign signs, spray painted driveway To share or post to your site, click on "Post Link". Please mention / link to America's Best Choice. Thanks! Posted by Bill Smith : Post Link --> 10:10 PM 0 Comments - Share Yours! Editorial Comment: This letters are beyond a Mail hoax, they are "Mail Fraud" and an attempt to interfere with the election process in Florida. But it very doubtful that we will find AG Eric Holder going after this issue! Update – Letters have been received in at least 21 Florida counties and most appear to be originating from Seattle, Washington – notorious for being one of the most corrupt areas in the country when it comes to voter fraud. In addition, Republican Party of Florida Chairman Lenny Curry received one of the fake letters on Tuesday. 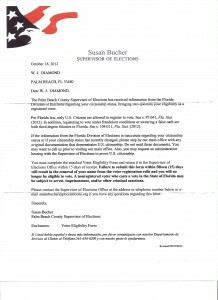 Voters all across Florida are receiving hoax letters in their mailboxes indicating that the county Supervisor of Elections office is questioning their status to vote in the upcoming Presidential Election. Orlando’s Fox 35 reports of at least 5 letters being received as far away as Collier County, and voters here in Orange County have also received them . . . The letters do not have an official return address and calls into question the voter’s citizenship, saying the resident is not eligible to vote unless a letter is returned in an enclosed form within 15 days. Almost predictably, the recipients seem to be exclusively white, registered Republicans who consistently vote in elections – ‘Super-Voters’ as they are termed. There is no telling at this point how wide spread the problem is. The Florida Division of Elections is aware and investigating the matter, which is against the law. If you should receive such a letter, contact your local officials immediately. Buckle up folks, the next two weeks promises to be a bumpy ride! Tags: Fraudulent Letters, mail fraud, interference with elections, Sent To Republican Voters, Florida To share or post to your site, click on "Post Link". Please mention / link to America's Best Choice. Thanks! Al Lawson has the wrong prescription for Florida. 44 billion dollars from Florida. the wrong prescription for Florida. Tags: Florida, FL-o2 Congressional District 2, Al Lawson, Cut Medicare, higher taxes, wrong for Florida, Americans for Tax Reform, To share or post to your site, click on "Post Link". Please mention / link to America's Best Choice. Thanks! Posted by Bill Smith : Post Link --> 1:08 PM 0 Comments - Share Yours! by The NRCC | http://www.nrcc.org/west | For generations, we've understood that with a little hard work, nothing was beyond our grasp. It's time we had a government that worked with us, and not against us. The "This is Our America" campaign shares stories from candidates and regular Americans around the country who are fired up about the 2012 election and have faith that America is bigger than it's challenges. The American dream very simply is the fact that a young man born in the inner city of Atlanta, Georgia 1961 now lives here. That's the American dream. There's no such thing as a Somali dream, a Chinese dream, there's one dream --- the American dream and that's why people came to these shores. Tags: NRCC, This is Our America, Allen West To share or post to your site, click on "Post Link". Please mention / link to America's Best Choice. Thanks! Gary Bauer, Contributing Author: With tonight's debate focusing on foreign policy, I want to make sure you see the latest ad my Super PAC, Campaign for American Values, has produced. Chavez, Putin and Castro endorse Obama...do you? If dictators are endorsing Barack Obama, why should American voters? Please share this message with your friends and family members. Help us spread the word! Tags: Dictators, endorsing, Barack Obama, Gary Bauer, Campaign for Working Families, To share or post to your site, click on "Post Link". Please mention / link to America's Best Choice. Thanks! Posted by Bill Smith : Post Link --> 5:58 PM 0 Comments - Share Yours! Want to vote twice for Obama in Florida? Hope Not! The video was produced by Project Veritas, an organization whose mission is "to investigate and expose corruption, dishonesty, self-dealing, waste, fraud, and other misconduct in both public and private institutions in order to achieve a more ethical and transparent society." A staff person working on the president's re-election campaign helped an undercover journalist register to vote for Barack Obama in Florida despite the reporter's expressed intention to vote twice in the hotly contested presidential race, video reviewed by Watchdog.org shows. The video, produced by independent journalist James O'Keefe, also shows Democratic activists helping register in New York an undercover reporter who says he's going to vote twice -- in Minnesota and in New York. But the most arresting footage shows an Organizing for America staffer in the group's Houston office providing a video journalist with an application to request a Florida mail-in ballot, even though the journalist has made it clear she intends also to vote in Texas. Grassroots arm of his re-election campaign) staffers for advice on double voting. In each circumstance the staffers are complicit in the illegal implications of voting twice. As noted by New Jersey Assemblyman Declan O'Scanlon, the reporter should have been warned at the potential illegality of her actions. "It's not a violation until the (second) vote is cast." "The worker should have said, 'That's illegal, you can only vote in one place. Which is it going to be?'" O'Scanlon said. New Jersey was one of the states where O'Keefe filmed his investigation. With less than a month to go, this is what America is dealing with Whether it's the media, volunteers, or Barack Obama and his campaign, there are groups who will stop at nothing to ensure Obama's reelection. We must all be watchful of what's going on and let other's know what Organizing for America is all about. Tags: Bobby Eberle, GOPUSA, double voting, voting twice, illegal votes, Florida, Project Veritas, video, election 2012 To share or post to your site, click on "Post Link". Please mention / link to America's Best Choice. Thanks! ARRA News Service - by Phyllis Schlafly, Eagle Forum: As we approach a major national election, we hear warnings about many kinds of vote fraud and possible recounts that might delay confirmation of who are the victors. We also hear from deniers who insist that vote fraud is a figment of the imagination of Republicans. It isn’t; vote fraud is real. Many instances of registration fraud schemes were carried out by ACORN, and some members were even tried and convicted. Although ACORN announced it was closing its doors, it reemerged under new names. It’s common knowledge that there are more registered voters in Philadelphia than there are people living in Philadelphia, because dead and moved-away voters have not been stricken from the list. Similar accusations have been made in a dozen other states. In Minnesota, we were entertained for weeks with news of the recounting of votes in the 2008 Minnesota election for U.S. Senate. Al Franken was declared the winner by 312 votes out of three million cast. After all was said and done, Minnesota discovered that 289 convicted felons had voted illegally in Hennepin County, 52 had voted illegally in Ramsey County, and many others voted illegally who were dead or who voted multiple times. That is reason enough for the U.S. Senate to use its constitutional power in Article I, Section 5 to unseat Franken. In a shocking case this fall, a good-looking Arkansas state legislator, Rep. Hudson Hallum, pled guilty to election fraud by bribing voters to vote their absentee ballots for him. He had applied for and distributed the absentee ballots, and the voters then gave the ballots to him in unsealed envelopes. If they were marked for Hallum’s opponent, they were pitched. The wide use of absentee and mail-in ballots has destroyed our traditional American secret ballot. This is a major loss of an important American right and an open door to election fraud. It’s important to know that it’s much easier to prevent vote fraud beforehand than it is to overturn an election suspected of being plagued with fraud. Can individual citizens do something to prevent vote fraud, or can we count on the government to protect us from the cheaters? There are things you can do right now, before the election. You can volunteer to be a poll watcher, sometimes called poll observers or challengers or checkers, and usually at least one watcher is allowed to be close enough to the election officials to be able to compare the voter’s signature with the verification record. State laws vary about the rights and duties of poll watchers and how many can be in a polling place. You can get some helpful advice and good instructions by contacting truethevote.org. Most state legislatures will go into session early next year, and now is the time they are planning the bills they want to pass. At the top of their list should be a photo ID law if they are not among the 17 states that already have such a law. There is no question about the constitutionality of voter ID because the Supreme Court upheld the Indiana voter ID law in 2008. The left squeals in pain about photo ID laws, claiming they are a conspiracy of Republicans to suppress vote turnout, especially of minority voters. There’s no evidence to support that claim and, in fact, voter turnout has actually increased in Indiana and Georgia where photo ID has been implemented. A citizen who lacks photo ID can prove identity with other documents. These include a state-issued ID, credit card, utility bill, bank statement, student ID, a government check or paycheck showing the voter’s name and address, birth certificate, or a passport. Minorities are actually among those most eager to implement photo ID. Former Atlanta Mayor Andrew Young said, “You cannot be part of the mainstream of American life today without a photo ID.” The sponsor of Rhode Island’s photo ID law was Harold Metts, who is the only African-American in the state senate. Just think of all the many occasions when we all must show photo ID: when stopped by the police for a traffic violation, to make a credit card purchase, to check in for any medical treatment, to check into a hotel room, or to board an airplane. Isn’t it just as important to assure that only American citizens are allowed to vote, and to prevent non-citizens from canceling out your vote, and to prevent crooks from voting twice or voting in the name of a dead person who is still registered? When your vote is nullified by illegal votes, you are cheated just as much as if you were denied the right to vote. Tags: Phyllis Schlafly, Eagle Forum, election 2012, voting, voter fraud, absentee voting, mail-in ballots, felons, Arkansas legislature plead guilty, illegals voting, legislatures, photo id To share or post to your site, click on "Post Link". Please mention / link to America's Best Choice. Thanks! Posted by Bill Smith : Post Link --> 5:27 PM 0 Comments - Share Yours! ARRA News Service - Chris W. Cox, Executive Director, NRA-ILA: You've heard it from Wayne and me for the past four years. And in Tuesday's presidential debate, you heard it from Obama himself. If Obama wins a second term in office, he's going to make banning your guns a top priority. You and I, as NRA members, have a duty to arm every gun owner and freedom-loving American we know with the truth about Obama's gun ban agenda. That's why I went on CNN yesterday to expose this threat to everyone within earshot. 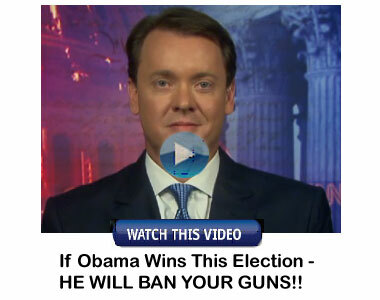 Go here to watch my interview and see how your NRA is fighting to make sure we defeat Barack Obama. Also, take a moment to go view NRA's new ad below that we'll be airing in major battleground states from now until Election Day. Obama gave a clear warning to you, me, and every gun owner in America that he's coming for our freedom if he wins reelection. Now we have to do everything in our power to make sure he loses on November 6th. The stakes couldn't be higher. Please forward these videos to your friends and family to help us get the word out. Tags: Barack Obama, banning guns, election 2012, NRA, Chris Cox, NRA-ILA, U.S. Constitution, 2nd Amendment, gun rights, defense To share or post to your site, click on "Post Link". Please mention / link to America's Best Choice. Thanks! Posted by Bill Smith : Post Link --> 4:20 PM 0 Comments - Share Yours! Also Read: Will Hillary Resign? 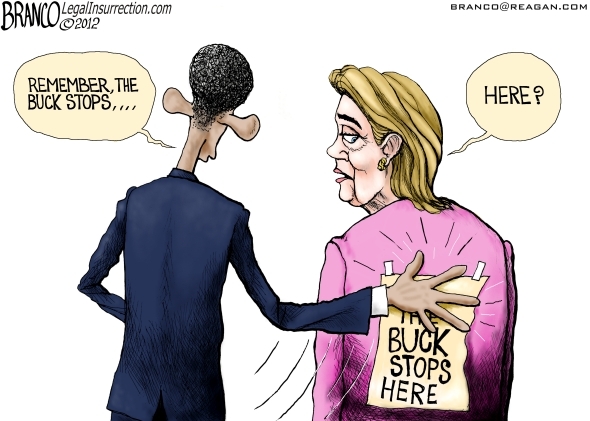 Tags: The Buck Stops, here, Barack Obama, Hillary Clinton, Libya, editorial cartoon, AF Branco To share or post to your site, click on "Post Link". Please mention / link to America's Best Choice. Thanks! Posted by Bill Smith : Post Link --> 1:55 PM 0 Comments - Share Yours! 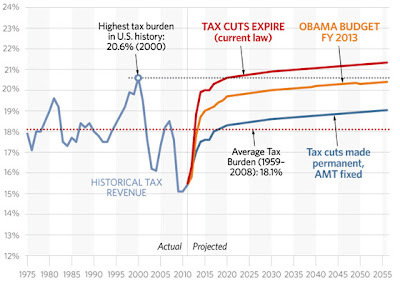 Taxes are projected to increase rapidly under different policy scenarios. If the 2001 and 2003 tax cuts expire and more middle-income Americans are required to pay the alternative minimum tax (AMT), taxes will reach unprecedented levels. 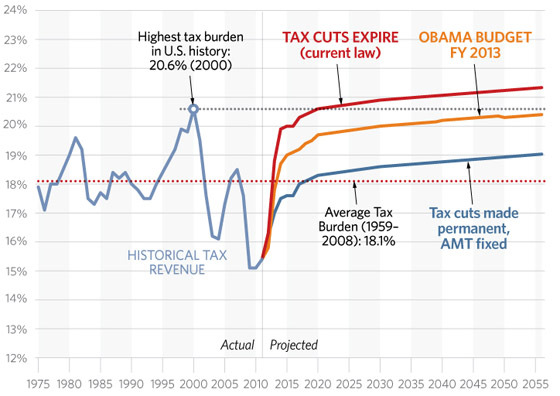 The tax burden will climb even if those tax breaks are extended. President Obama's budget, which cuts some taxes and raises others, increases the overall tax burden. Michael Sandoval, Heritage Investigate: On January 1, 2013 nearly $500 billion in tax hikes will go into effect. About 120,000 high-income families would get an additional $500 billion tax cut over 10 years. False. This is not a tax cut. It is the absence of a tax hike. Not raising taxes on high earners, who actually happen to be job creators, is not the same as cutting their taxes. President Obama and Vice President Biden have a troubling habit of arguing their case in this way. It is troubling because to take that stand is to presuppose that the money we all earn is actually the government’s in the first place. Hopefully they don’t really believe that to be the case. Only when the government presupposes–as Dubay and Boccia write–that the money earned by those 120,000 families rightfully belongs to the government and not the families themselves does avoiding a tax hike become a tax cut. Taxmageddon is causing widespread uncertainty that is slowing the economy right now, and, if it hits on January 1, 2013, the blow it would deliver to the already staggering economy would be severe. 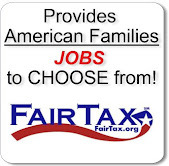 Congress should not delay stopping Taxmageddon by engaging in unnecessary attempts to pay for phantom revenue losses. Congress should evaluate stopping Taxmageddon against a current policy baseline, which would clearly show that stopping Taxmageddon is not a tax cut and does not raise the deficit and that therefore Congress does not need to pay for stopping it. The sooner it realizes this and votes to stop Taxmageddon, the better. Tags: congressional budget office, economy, job losses, Joe Biden, Office of Management and Budget, tax hikes, tax policy, taxmageddon, Heritage Investigates To share or post to your site, click on "Post Link". Please mention / link to America's Best Choice. Thanks! 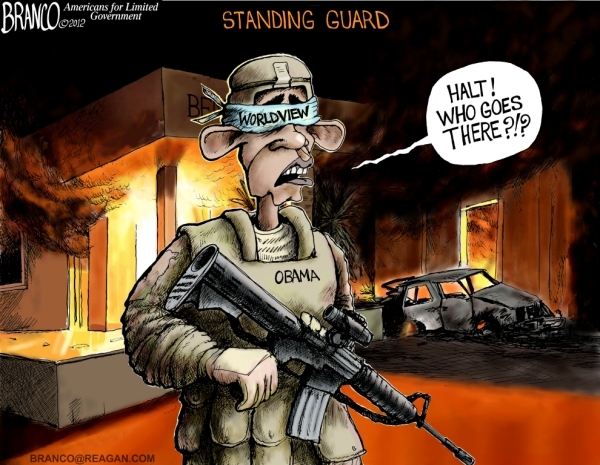 Tags: standing guard, not, foreign terrorism, Barrack Obama, political cartoon, AF Branco To share or post to your site, click on "Post Link". Please mention / link to America's Best Choice. Thanks! Posted by Bill Smith : Post Link --> 1:29 PM 0 Comments - Share Yours! Almost 3 million views of the following video. Help make it so. Watch it and then send the video to your friends. Dr. Barbara Bellar "Summed Up Obamacare in One Sentence!" She is a is a candidate running against the Chicago Machine for State Senate in the Illinois 18th District. She could use your help! With the national attention she is receiving from this video, you know that the Chicago Machine will be even more motivated to defeat me. Besides sharing this video, if you would like to aid her campaign visit ElectBellar.com. Option: View her complete speech. 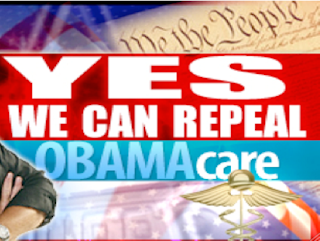 Tags: Obamacare, one sentence, Barbara Bellar, doctor, video, candidate, Illinois, State Senate, 2012 election To share or post to your site, click on "Post Link". Please mention / link to America's Best Choice. Thanks! Posted by Bill Smith : Post Link --> 4:06 PM 0 Comments - Share Yours! Read: How $50,000 exploded into $1.25 billion? Lachlan Markay, Heritage Investigates: The U.S. Department of Agriculture will pay up to $50,000 each to female and Hispanic farmers and ranchers who claimed they were discouraged from applying for USDA loans due to perceived discrimination. But those farmers won’t be required to prove that they ever actually farmed. The payments are part of a settlement agreement reached between the USDA and North Carolina farmer Timothy Pigford that created a $1.33 billion fund to compensate farmers who say they were discriminated against by USDA officials between 1981 and 2000. Previous payments have gone to black and Native American farmers. The women and Hispanic farmers fund provides different levels of compensation based on the nature of the alleged discrimination. Tier 1(a), as it’s known, is comprised of farmers and ranchers “who sought to apply for a USDA loan but were actively discouraged from submitting an application” due to perceived discrimination. In other words, by definition, USDA has no record of 1(a) claimants actually applying for a federal loan. And according to documents USDA is providing to would-be claimants, a 1(a) payout requires minimal documentation showing that they actually farmed during the period in question. According to a checklist of required claimant submission materials, USDA requires that all tiers submit “documentation of farm land ownership interest, if available” [emphasis added]. In other words, documents showing that one actually farmed are optional. “A document from a non-family member to you, or from you to a non-family member that supports your contentions” is the extent of the documentation required for 1(a) claimants to demonstrate that they owned or had a stake in a farm from 1981 to 2000, according to the USDA checklist. While that requirement does provide some measure of protection against false claims, it comes significantly short of the “documentation of farm land ownership interest” that USDA says is not required to qualify for a payout. USDA did not respond to multiple requests for comment. Rep. Steve King (R-IA), who scrutinized previous USDA discrimination payouts, told Scribe that the department “has not put in place adequate safeguards to prevent exploitation” of the female and Hispanic farmers settlement. 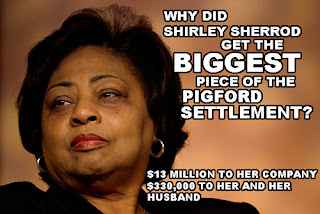 “The Pigford settlement created fraud of historic proportions and now the Obama administration is heading down the same path by creating a payout system for women and Hispanic farmers,” King added. The Pigford settlement to which King referred established& ;a fund to reimburse black farmers, and drew significant scrutiny on that front. “Any time you’re trying to go back and compensate people based on past discrimination, figuring out who should be compensated and how much is always tricky, so the devil’s in the details,” Emory University political scientist Alan Abramowitz said of Pigford in 2010. 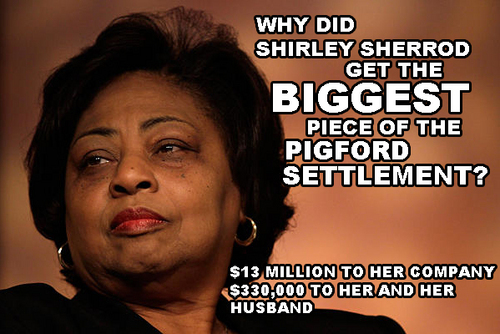 According to some reports, Pigford paid out settlement money to about 80,000 black farmers, even though there were only about 33,000 such farmers in operation during the period in question. Tags: agriculture department, discrimination, pigford, USDA, payoffs To share or post to your site, click on "Post Link". Please mention / link to America's Best Choice. Thanks! Posted by Bill Smith : Post Link --> 9:42 PM 0 Comments - Share Yours! by Gary Bauer: The health care reform law known as Patient Protection and Affordable Care Act, aka Obamacare, is Barack Obama's signature first-term accomplishment. Given the size and importance of America's health care industries, taking over our health care system has long been a major goal of the American left. Rep. John Dingell, Jr., (D-MI) introduced nationalized health care legislation every year for over fifty years. His father, Rep. John Dingell, Sr., began fighting for universal health care coverage in 1935. Health care spending accounted for more than 17% of America's economy in 2009. Trillions of dollars are at stake. Control of our health care and all it entails -- our lives -- is at stake. And Rep. Dingell even said as much when he acknowledged that "...it takes a long time to do the necessary administrative steps that have to be taken to put the legislation together to control the people." In March 2009, Barack Obama and congressional Democrats began their latest attempt to socialize our health care system. They did so to the neglect of all else, including jobs and the economy. With the unemployment rate soaring to a 25-year high, health care "reform" was Barack Obama's top priority. On Christmas Eve 2009, the Senate passed health care reform legislation on a party-line vote of 60 to 39. In March 2010, the House of Representatives passed Obamacare on a vote of 219 to 212. The most bipartisan aspect of the bill was the opposition to it. Not a single Republican voted for the bill in either chamber of Congress, and 34 House Democrats voted against it too. President Barack Obama signed the bill into law on March 23, 2010. To keep this report as brief as possible, we will focus on just a few of Obamacare's most obvious failures: Massive Tax Hikes, Rationing, Assaults On Liberty and Broken Promises. Obamacare is loaded with tax increases. In fact, the Supreme Court upheld the constitutionality of Obamacare based on Congress' ability to impose taxes. According to the Heritage Foundation, there are at least 18 different tax increases contained in Obamacare totaling more than $830 billion over the next decade. That's $830 billion taken out of the private sector to fund a massive, new entitlement program at a time when the country is already trillions in debt. These taxes will devastate job growth as those resources will be in the hands not of job creators, but rather government bureaucrats. In fact, Darden Restaurants (owners of Olive Garden and Red Lobster) recently announced that it was cutting back the time its hourly workers could be on the job. In a statement Darden said that the reduced hours were "one of many things we are evaluating to help us address the cost implications health care reform will have on our business." In this case, Obamacare means less work and less pay for hourly workers. Caps on Flexible Spending Accounts ($13 billion) -- This tax will hit families with children with special needs particularly hard. "IPAB will essentially mean rationed care for our nation's seniors. The 15 officials who will make up the board will not only be empowered to make what is expected to be billions of dollars' worth of cuts to Medicare every year, but will be required to do so when spending exceeds targeted rates. "Now, years later, more seniors are beginning to understand that IPAB's creation and the $500 billion in cuts to the Medicare program meant to help pay for the law were anything but helpful to them." The IPAB was a way for Democrats to avoid taking responsibility for creating entitlements we can't afford. Rather than make tough choices, they passed the buck to an unelected board. In England, there is a similar board known as the National Institute for Clinical Effectiveness (NICE). This board routinely denies coverage of life-saving or pain-relieving drugs it determines are too expensive. On March 22nd, the Republican-led House of Representatives voted 223-to-181 to repeal IPAB. Seven Democrats voted with the overwhelming majority of House Republicans to kill Obama's rationing board, proving once again that the only bi-partisan aspect of Obamacare is the opposition to it. Obamacare represents an unprecedented assault on individual liberty. The law largely hinges on the individual mandate, and, as previously noted, the Supreme Court only upheld the mandate under Congress' power to impose taxes. The court rejected the constitutionality of every other argument for Obamacare, such as the regulation of interstate commerce. Obamacare is a tax, and it is a very unusual tax in that it is imposed on those who do not buy a specific product. This is a dangerous precedent and a dangerous expansion of government power. It is not hard to argue that it would be in the national interest to protect and preserve the jobs associated with the domestic auto industry. Indeed, the government saw fit to invest tens of billions of dollars in the auto bailout. In the interest of securing that taxpayers' investment, could Congress impose taxes on individuals who fail to buy domestically produced automobiles? There seems to be few limits to this new authority. "No government has the right to compel its citizens to violate their conscience. The HHS rules trample on our most cherished freedoms and set a dangerous precedent." An open letter from leaders of the Southern Baptist Convention:"The federal government's decision is a flagrant violation of the First Amendment's free exercise clause protections enshrined in the U.S. Constitution. … In the draft of the Virginia Act for Establishing Religious Freedom (1779), [Thomas] Jefferson wrote, 'To compel a man to furnish contributions of money for the propagation of opinions which he disbelieves and abhors, is sinful and tyrannical.' The Obama administration's mandate on contraception coverage is a blatant and outrageous encroachment on religious freedom." In May, scores of Catholic dioceses and other institutions filed a dozen federal lawsuits seeking to overturn the mandate. The lawsuits were joined by evangelical institutions such as Wheaton College, Biola University and Grace College. Potentially facing fines of more than $1 million a day, the Christian-owned-and-operated company Hobby Lobby joined the law suits in September. In Obama's America, health care reform comes with a very steep price in terms of taxes and freedom. In selling Obamacare to a skeptical public, Barack Obama and congressional Democrats made a lot of dubious promises. The worst were Obama's promise not to raise taxes on the middle class and his oft-repeated claim that if you like your current health insurance, you will be able to keep it. In September 2009, Barack Obama was interviewed by ABC's George Stephanopoulos about the developing health care reform law. Consider this exchange: STEPHANOPOULOS: You were against the individual mandate during the campaign. Under this mandate, the government is forcing people to spend money, fining you if you don't. How is that not a tax? OBAMA: No. That's not true, George. For us to say that you've got to take a responsibility to get health insurance is absolutely not a tax increase. …Right now everybody in America, just about, has to get auto insurance. Nobody considers that a tax increase. People say to themselves that is a fair way to make sure that if you hit my car, that I'm not covering all the costs. STEPHANOPOULOS: I don't think I'm making it up. Merriam Webster's Dictionary: Tax -- "a charge, usually of money, imposed by authority on persons or property for public purposes." OBAMA: I absolutely reject that notion.Obama may have rejected the notion that his individual mandate was a tax increase, but it was the only notion that the Supreme Court accepted in order to uphold Obamacare's constitutionality. Moreover, Obamacare's honest defenders knew it was a tax increase and, unlike Barack Obama, they did not deny it. "When Congress required most Americans to obtain health insurance or pay a penalty, Democrats denied that they were creating a new tax. But in court, the Obama administration and its allies now defend the requirement as an exercise of the government's 'power to lay and collect taxes.' And that power, they say, is even more sweeping than the federal power to regulate interstate commerce. "In the same report, the New York Times quotes Professor Jack Balkin of Yale Law School, a strong supporter of ObamaCare who filed a brief defending the constitutionality of the individual mandate. Dr. Balkin put it bluntly, saying that President Obama "has not been honest with the American people about the nature of this bill. This bill is a tax. Because it's a tax, it's completely constitutional." So what should we conclude? Did the president and congressional Democrats not know what was in the bill they were pushing? Or, as Professor Balkin suggests, did Obama know but choose to deceive George Stephanopoulos and the American people in order to win by any means necessary? In 2014, Obamacare's individual mandate tax kicks in. The Congressional Budget Office recently estimated that six million Americans -- 50% more than initially estimated -- will be forced to pay this new tax for not purchasing health insurance. By 2016, the penalty will average $1,200, and 80% of those impacted will be individuals making less than $56,000 or families making less than $115,000 -- a clear violation of Obama's promise not to raise taxes on the middle class. What about Obama's promise that you can keep the health insurance you have now? That too was a lie. Last month David Barr addressed a convention of franchisee owners in Washington, D.C., and told them how Obamacare would impact his business. Barr has 421 employees, 109 are full-time. He currently pays $129,000 a year to provide health insurance. Under Obamacare, he estimates his costs will skyrocket to $440,000 -- "over half his annual profit." But Barr has another option. If he cancels his insurance policies and simply pays the fine, he's out $158,000 -- a savings of $282,000. What do you think most businesses faced with such a choice would do? Major corporations like John Deere, Verizon and AT&T have crunched the numbers and determined that they are better off paying the fines rather than providing health insurance to their employees. For example, AT&T spends $2.4 billion a year on health insurance 300,000 employees. Obamacare's fines for not providing health insurance would amount to only $600 million if the company dropped its health insurance and dumped its employees into Obamacare's state exchanges. Thanks to Obamacare, AT&T estimated it could save nearly $1.8 billion a year by cancelling its health coverage. "…we'll also have to pay a federal penalty of $2,000 for each employee because we no longer offer health insurance; that's another $86 million. … But if we keep our existing insurance plan, our cost will be $346 million. We can reduce our annual costs by over $146 million using the legislated mechanics of health reform to transfer them to the federal government. … Our thought experiment shows how the economics of dropping existing coverage is about to become very attractive to many employers, both public and private. "According to a February 2011 survey by a management consultancy firm, 30% of employers were likely to drop health insurance coverage by 2014 due to Obamacare regulations. The survey found that "the number rises to 50 percent among employers who are highly aware of the health care law." No, you won't be able to keep your current health insurance. This is not an accidental side effect. Barack Obama supports the socialist single-payer model and has spoken openly about phasing out employer-provided health insurance coverage. Obamacare was designed to destroy private health insurance and lead to a socialist, big government takeover of health care. Lastly, Barack Obama repeatedly promised that his healthcare reform law would lower costs for the typical family by $2,500 per year. That has not happened. In fact, from 2008 to 2012 health care premiums have gone up $3,000. Note: The 40 identified references are all linked to the source. Tags: Gary Bauer, Campaign for Working Families, Special Report, Obamacare, Medical Malpractice, political malpractice To share or post to your site, click on "Post Link". Please mention / link to America's Best Choice. Thanks! Checkout the video below, U.S. Senator Bill Nelson is "milking taxpayers and the system!" Disappointed - trusted this former congressional astronaut to not stoop this low. His time with Nancy Pelosi in the House and Harry Reid in the Senate have taken its toll. He votes with and supports Obama. Time for Nelson to be retired before he winds up in jail. The youth unemployment rate for 18-29 year olds in September 2012 is 11.8% (NSA). To compound the problem, an additional 1.7 million young adults are not counted as "unemployed" by the U.S. Department of Labor, meaning they have given up looking for work due to the lack of jobs. If these 1.7 million were added into the overall figure, the actual unemployment rate for 18-29 year olds would be 16.6%. The youth unemployment rate for 18-29 year old African-Americans for September 2012 is 21.0 percent (NSA); the youth unemployment rate for 18-29 year old Hispanics for September 2012 is 12.1 percent (NSA); and the youth unemployment rate for 18–29 year old women for September 2012 is 11.6 percent (NSA). 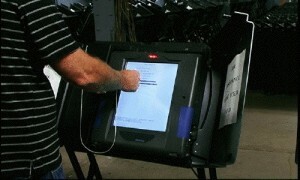 Tags: Florida, U.S. Senate, election 2012, Bill Nelson, To share or post to your site, click on "Post Link". Please mention / link to America's Best Choice. Thanks! Posted by Bill Smith : Post Link --> 12:10 PM 0 Comments - Share Yours! Home Depot Founder Bernie Marcus shares his concerns Home Depot Founder Bernie Marcus shares his concerns for our nation and how frightened he is by what Pres. Obama's policies mean for America, especially for our children and future generations. In particular, the lack of job creation and rising home foreclosures are limiting the American dream for millions of families. Bernard "Bernie" Marcus (born 1929) is an American pharmacist and retail entrepreneur. 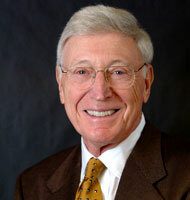 He co-founded Home Depot and was the company's first CEO; he served as Chairman of the Board until retiring in 2002. He is an active philanthropist and is the chairman of the Marcus Foundation. 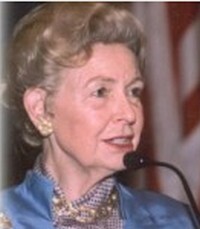 Bernie Marcus also funded and founded The Marcus Institute, a center of excellence for the provision of comprehensive services for children and adolescents with developmental disabilities. Tags: Home Deport, founder, Bernie Marcus, the economy, jobs, Obama's policies To share or post to your site, click on "Post Link". Please mention / link to America's Best Choice. Thanks! Adam Hasner for US House - "Math"
Tags: Florida, District 22, Adam Hasner, Candidate for Congress, 2012 election To share or post to your site, click on "Post Link". Please mention / link to America's Best Choice. Thanks! Posted by Bill Smith : Post Link --> 6:40 PM 0 Comments - Share Yours! Transcript: Florida Liberal U.S. Senator Bill Nelson is at it again like a bungling Keystone Kop. He keep saying one hing to the people of Florida and does another. Bill Nelson votes like a lock-step liberal with Barack Obama. Bill Nelson told Floridians he supported the Keystone pipeline. But, then Barack Obama asked him to oppose the pipeline. So Keystone Kop Nelson votes against it. Bill Nelson's Keystone Kop routine might be humongous - it's not! It's wrong - it's sad. Bill Nelson and Barack Obama - lock step liberals - wrong for Florida - wrong for America! Tags: Bill Nelson, Keystone Kop, Keystone pipeline, Barack Obama, liberal, Florida, election 2012 To share or post to your site, click on "Post Link". Please mention / link to America's Best Choice. Thanks!